Its Top Five Thursday again! This time, I have chosen to do my top five highlighters. Typically, on an everyday basis anyway, I don't actually wear a powder highlighter. This is because I wear a dewy finish foundation on most days, so I don't usually need to add a highlight to give me that dewy glow that I need. Lately though, I have been loving adding a liquid highlighter to my foundation to really make my base all radiant and glowly. It just gives that added boost I feel, especially when I may be feeling a little worse for wear. Because I am a full time university student, who also works part time and spends any spare time doing assignments or blog posts, my skin has been feeling a little tired and dreary of late. But, with a highlighter who needs to know that underneath that glowing, radiant complexion is a pale face with eye bags. Am I right? 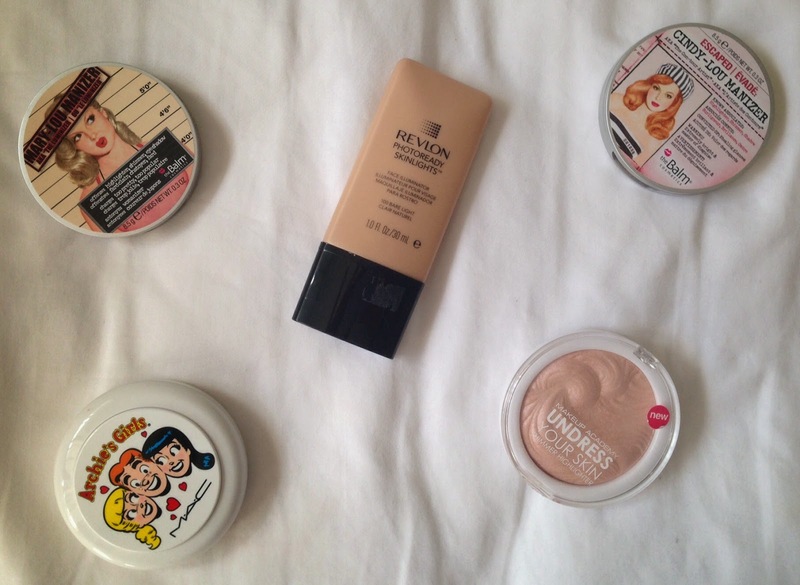 Read on to see all about my top five highlighters! This is an amazing powder! Honestly, I was more excited for this collection than any other from MAC because I loved Archie comics as a kid. I brought most of the collection, but the hidden gems were these Pearlmatte face powders! Honestly, the other powder 'Veronicas Blush' is more of a highlighter, but this one is just so beautiful. Its a bronze pink shade, with coral pink hearts. I love to swirl them all together, and use it as a blush especially in summer. It gives such a lovely sheen to my skin, so it almost doubles as both a blush and a highlighter for me. But for darker skin tones, I can imagine this could work as a highlighter. This was limited edition, so unfortunately is not available in stores anymore. You can check makeup exchange sites or Ebay even if you would like to take the risk. A cult favourite highlighter, this is definitely my go-to powder highlighter. It's a beautiful honey hued champagne shimmer colour, and it just works so well with my skin tone. You do have to be careful when using it though, as it can turn you into a disco ball very quickly. I put this lightly onto the tops of my cheekbones, the bridge of my nose and my cupids bow, and then with whatever is left on my brush I dust lightly onto my chin and the centre of my forehead. This retails for $34.95AU at David Jones stores, but you can also find it at select boutique online stores as well. I got this in my Priceline 40% Off Cosmetics haul, and also featured it in my March Beauty Favourites. I adore this, I know use it pretty much everyday in order to get that boost of radiance and glow. It is just gives such a subtle glow. I wouldn't say you could use this by itself to achieve a highlighted look - it just wouldn't show up with you were to put it along the tops of your cheekbones and the length of your nose. But, it is perfect for mxing with whatever you are using as your base for the day just to give a radiance boost to your overall appearance. This retails for $29.95AU at Priceline stores, but I did get this on sale of $17.95AU. This is the newer addition to the TheBalms range of highlighters, and it is a pink toned highlighter. And it is beautiful! In the summer time, this could probably be used as a highlight for tanned skin, but for my fair skintone I have been using it as a blush, just to get that sheen on my cheeks. It really makes my skin look so healthy! I would say its just gives that flushed look to my skin, without going overboard. In my opinion, it's similar to the colour and effect you get when you use Milani's Baked Blush in Luminoso, but with even more pigment This actually hasn't been released into the Australian market yet, but once it does, I assume it will be the same price as the Mary-Lou Manizer ($34.95AU). If you really cannot wait, you can search select online boutiques that stock TheBalm, I'm sure they would have it! This is the best option for those on a budget. It is a pink toned highlight, and you just need to touch your brush into the pan to get the shimmer onto your cheeks. When put onto your skin, it has a subtle baby pink glow with lots of shimmer. And again, with the Mary-Lou Manizer, this really goes the longest way. I have had the highlighter for FOREVER and have barely made a dent in it. I can't recommend MUA products enough - they are seriously so affordable and such good quality for the price you pay. This retails for about $5AU, and is available to buy here. What are some of your favourite highlighters? Let me know in the comments below! Click here to read last weeks edition of Top Five Thursday! Oh wow! Thank you so mucn, will check it out now!